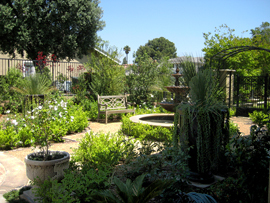 Landscape Planning and Design – For over 25 years James Baylie Design has provided unique landscape design solutions for numerous clients throughout Los Angeles and Orange Counties. Our cooperative design process ensures that every design is custom tailored to the needs and desires of each individual client. 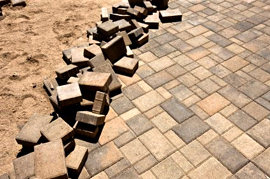 Our landscape design will provide enjoyment for the homeowner, and will also add significant value to the property. 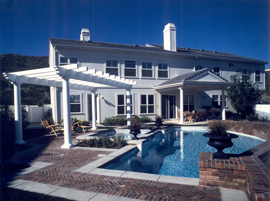 Pool and Spa Design – Adding or upgrading a pool or spa will enhance a homeowner’s property. 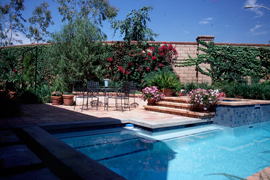 If designed properly, pools and/or spas can have a dramatic impact to an outdoor living area. Pools offer a great way to entertain family and friends, and provide an excellent means for non-impact exercise. We have worked with a number of premier pool construction companies in the area to ensure our clients receive a high quality, well constructed, long lasting pool or spa. 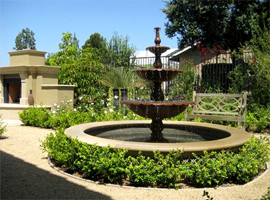 Fountains, Garden Ponds, Waterfalls - Beautiful water features enhance your home and garden décor, from the smallest patio to the largest landscaped garden. Listening to the gentle sound of flowing water is one of the most soothing and natural ways to relax and unwind from the stress of everyday life. Most of us do not have the advantage of living near a secluded, babbling brook, but we can enjoy the next best thing with an outdoor water feature. Patios, Walkways, Driveways, Retaining Walls – While being highly practical, patios, walkways and driveways can also be esthetically pleasing. They are one of the best ways to add functionality and design accents to an outdoor environment. Well designed patios and retaining walls can greatly extend the usefulness of an outdoor living space. Fireplaces, Fire Pits - Nothing brings a more comfortable atmosphere to an outside living space than having an outdoor fireplace. 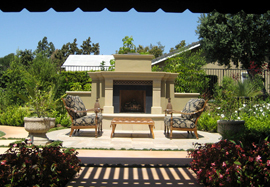 An outdoor fireplace or fire pit creates added warmth and beauty; it also extends the use of an outdoor space into the evenings and cooler seasons. Kitchens, Barbeques, Bars - An outdoor kitchen or barbeque is an all-time favorite among homeowners to enhance their backyards for entertaining. 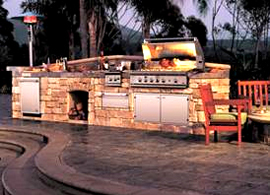 Outdoor kitchens offer many immediate advantages over conventional indoor cooking. Guests and family are easily involved in the cooking process which can make the meal fun. If designed properly the versatility of an outdoor cooking area will never cease to amaze even the most experienced chef. 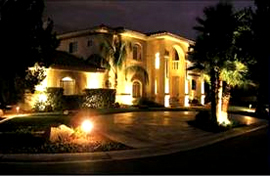 Landscape Lighting – Residential landscape lighting can provide safety, security, and drama. Lighting can be designed to highlight trees, shrubs, outdoor structures, walkways, entrances, and retaining walls. Today’s outdoor lighting systems and fixtures offer a wide spectrum of options. 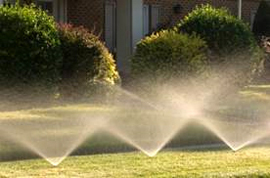 Irrigation Systems – Irrigation systems are needed to ensure lush green lawns and healthy landscaping. Sprinkler systems extend the life of your plants and lower your water usage. A properly designed and installed irrigation system protects the homeowner’s investment. Landscape Installation and Construction Supervision – Working with some of the best landscape construction companies in the area, James Baylie Design can oversee all aspects of the construction and installation of a landscape project. James can act as the overall project manager and as a liaison between the homeowner and construction companies.